This article is a detailed guide about how you can activate your Ozeki VoIP SIP SDK in your development server. 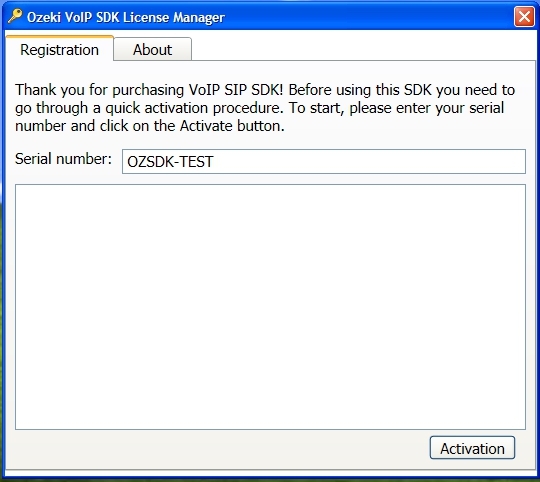 After reading through this page you will be fully familiar with all the essential terms concerning Ozeki VoIP SIP SDK activation in a development server and what you will need for creating your own solution using Ozeki VoIP SIP SDK. Product activation is a license validation procedure required by proprietary computer software programs. After the trial version of a software has expired (after a certain period of days), it is necessary to start the product activation process. This process is tightly connected to the license purchase. See, after the trial period is over you will not be able to use the software anymore without activation. You can get the activation code by purchasing a software license from the vendor company. In most cases you can choose from various licenses, according to your needs. After you have started the licensing process and have paid for the chosen license, the vendor sends you the unique activation code. You type this code into the window appearing when running the program (after trial period expired), and you are able to use the program again. Moreover, you are able to use the complete version of the program as most trial versions only contain some basic functions of the product. This page will guide you through the activation process, step by step. 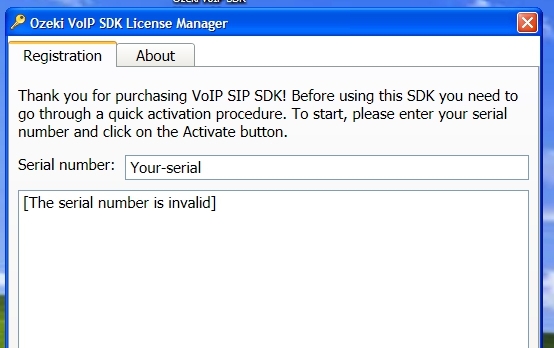 After activating Ozeki VoIP SIP SDK on your development server you can start to use the complete version of the program and build your own VoIP solution. Important! : You do not have to purchase a license for every server you use. You can use even a single license on any number of servers. 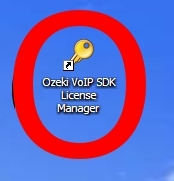 When you have installed the Ozeki VoIP SIP SDK, the Ozeki VoIP SDK License Manager has also installed on your system. You can find a link to this License manager on the desktop (Figure 1). If you want to activate your SDK you need to start the License Manager. The License manager window contains a Registration and an About tab. The About tab contains the version information of the SDK, some information about Ozeki Ltd. and the developers. When you want to activate your SDK you need the Registration tab. 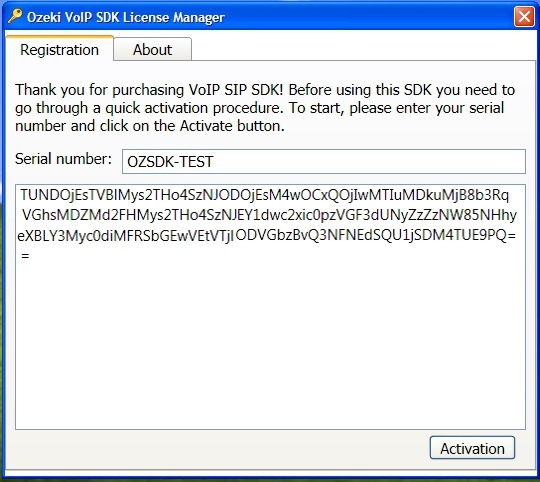 You need to enter the serial number you got after purchasing the SDK in the textbox and press the Activation button (Figure 2). If you have typed in a valid serial number, pressing the Activation button will generate you the activation key that will appear in the big textbox on the License Manager window (Figure 4). You will need to use this activation key with your serial number in your program to have the activation finished. Now you have the activation code that can be used in your VoIP solution. You can check how you can finish the activation on this page. If the above mentioned functions have called your attention contact us at info@voip-sip-sdk.com. You can check licensing information about Ozeki VoIP SIP SDK on Pricing and licensing information page. This article introduced you the basic knowledge about activating your Ozeki VoIP SIP SDK in a development server. If you have read through this page carefully, you already have all the knowledge you need to start on your own solution.